"You're American?" asked the one in the light blue shorts. Two women, obviously not from Namibia, sat at a table next to ours at a sidewalk cafe along an avenue leading to the ocean. "We are. Bellevue, Washington. Where are you from?" asked the one blonder than the other. "My son and I are from Portland. John, here, is from Boise, and Tim is from Kalispell." "Wow, what a small world. We're practically neighbors. What brings you to Africa? Vacation?" "Oh?" Did I detect disapproval? "And you, what brings you to Africa?" "Well kinda, but not really. We're biology majors at the University of Washington. We just enjoy watching birds." "Something I like doing too." The rainy season is coming to an end and soon the streets of Swakopmund would be teeming with people seeking respite from the higher temperatures of the inland. 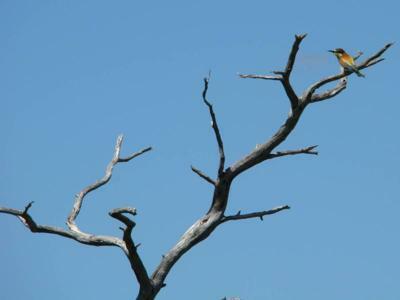 European Bee-eaters feast on the dragonflies and mantises, preparing for their annual migration over the velds and savannahs and deserts and mountains of Africa to nest in the steeples of Tuscan basillicas, or along the Ruhr, or even further north to the slopes of the Urals. "So what do you hunt?" "So what birds have you seen?" "Sorry, you first," I apologized. "No, please. I mean, what do you hunt?" "This time I'll be after Zebra. John's after Kudu, and Gemsbok." "Oh. What do you do with them, I mean, after...after..."
"After I shoot them? Except for the hide and horns, I eat them." "Isn't that...uh, a lot of meat? I mean, isn't that a waste?" "But I share the meat with the locals. Impolite not to. In fact, they get the greater part of the meat. Why, you a vegetarian?" "No, it's just...I mean, you really eat zebra?" "Yes, and Kudu, and Oryx, and Springbok, and...you mean you haven't had any of the game meat here in Namibia? Delicious, you don't know what you're missing." Almost motionless, riding the Benguela winds, a Cape Gannet hovers. In an instance it plunges straight down into the cold Atlantic and just as quickly rises, its beak holding captive a small sardine. The waitress brings to the tourist women steaks trimmed with vegetables, sides of bread, and salad. The Baster girl, white-aproned, smiles and awaits her customers' approval. "Thank you, er....excuse me, Miss. What kind of meat is this? ", asked the blonder of the two. "Steak, ma'am. Is it as you like? Is it cooked enough?" "No, I mean yes. I ordered it medium well. But what kind of meat is this, you know, I mean what animal?" "Cow, ma'am." out of the girl's uneasy English vocabulary. Don't worry. It's not Zebra." I said, hoping to clarify and assist. They examine their steaks carefully, suspiciously. After a few small bites the two decide that they have eaten enough and must watch their diet. "So, tell me, what birds have you seen here in Namibia?" "Nothing yet. We just got here, I mean, from Windhoek. Spent last night there." said the one in light blue shorts. "So you're going to start your bird watching here in Swakopmund?" "Well, sort of. We'll rest for a few days. Maybe head down to Walvis Bay to see the flamingoes. Have you been there?" "Yes. You'll find them in the lagoon, along with cormorants, sandpipers, gulls, and pelicans." "Cool. And what about inland?" "Depends on where you're going." "We don't know. You seem to know your way around. Where would you suggest?" "Well, between here and Okahandja there's the Erongo Mountain Range." "What birds have you seen there?" "I've seen the yellow hornbill." "You mean the Southern yellow-billed hornbill, Tockus erythrorhynchus rufirostris?" said the one blonder than the other. "Uh, yeah, right." I was a bit amazed at these girls' more than casual knowledge of one of Namibia's ornithological specimens. "Uh, well, the Kori Bustard..."
"Uh, yeah. And the Bataleur, or the Berghaan, as they say in Afrikaans." "Yeah, right. And the Crimson-breasted Shrike. In Afrikaans it's the Rooibors-fiskaal. In German, it's the Reichsvogef because its crimson, white, and black, reminded the early settlers of the colors of the old Imperial German Flag." It was my turn to impress. "Wow, those are some of the birds we want to see. Can't wait. Tell me, out of all the birds here in Namibia, what's your favorite?" "Which one, the Red-billed or the Orange River?" "They remind me a lot of the quail that I used to hunt back home." A brown flutter of wings rose from a bush 20 feet to the right and in front of me. It caught me completely by surprise and off-balance. I twisted my body around and brought the 16 gauge double to shoulder. The Sand Grouse banked left just as I pulled the trigger. The unfortunate bird took the wrong turn and flew into a hail of my poorly placed Number 6 shots. Lucky for me. Bad luck for the bird. Last year, in the Khomas Hochland, it was a year for birds. It was a very good year. "Nice girls but kinda rude that they left so abruptly, don't you think?" said John. "You amaze me", said Tim. "I didn't know you were such an avid bird watcher." "I am. In fact I'm watching two right now." "Where?" Tim hastened to get the telephoto-lensed camera from his bag. "There, just going past the palm trees. Two Blondius Americanus." WANT TO RETURN TO NAMIBIA.. Thank you for submitting this great story. Wonderful dialogue, even from the Blonde!! A great Namibian Holiday would await anyone who followed your travels. A very well written story really enjoyed it but it is not a HUNTING STORY. I enjoy the authors humor in his writing. Enrique, your writing is amazing. I have read all of your work on this website. They are superb stories and belong in a book of short stories. Are you a professor of Literature or creative writing, by chance. The dialogue in your bird story was creative and unique. Thank you for entering the contest.